Every business faces its own unique security challenge, and a one size fits all solution simply does not work. Taking in to account a range of factors and working closely with you the customer, we carefully design a commercial surveillance system that will best to suit your requirements and budget. Enter your details in the request quote form to find out exactly how affordable it is to have a Commercial Surveillance System protecting your business! Solution Safe recommends products for superior image quality. 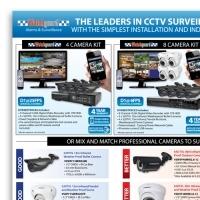 The videos below show the difference between analogue and digital CCTV systems. An analogue system is sufficient for recording general informaion (e.g. was there a vehicle there). However, a digital system will give you enough detail to determine important scene information (e.g. a vehicle registration).